We are almost 20 days into January. How are you doing with your New Year’s resolution? Is it going well, or do you feel yourself beginning to backslide? I have always been a big proponent of New Year’s resolutions despite the well-known fact that success rates are low and by the time February rolls around, most us are beating ourselves up because we are not doing what we set out to do. So before next month descends upon us, I thought I would explore a couple of ways that may help me - and others like me - to either stay on track or shift our perspectives so we don’t feel we are fighting a losing battle. In his article with Psychology Today’s online publication, “Why People Can’t Keep Their New Year’s Resolutions”, author of “Breaking Bad Habits,” Ray Williams shares some insights. He provides a number of explanations as to why it is difficult to keep the promises we make to ourselves but there seems to be one consistent factor that other authors and scientist mention. Having resolutions involve changing behaviors - and in order to change a behavior, you have to change your thinking. This requires a lot of work. But it doesn’t mean it can’t be done. For example, losing 10 pounds in 90 days is a specific and attainable goal. Simply stating, “losing weight” is not. And, whatever you do - try to begin with one resolution. I suppose I should scale back on that two-page resolution list. Take small steps towards your goals, renewing your commitment every day. I keep a journal, and I find that this is helpful to assist me in keeping tabs on how I am doing. When necessary, I adjust. Don’t wait until you reach the final end of your goal, instead - celebrate the “baby steps” that help you get closer to your goal. Celebration? I’m adding that one. I love celebrating. Find a friend, sibling, spouse, etc. who will support you along the way. My husband and a few friends are my cheerleaders. Although creating the changes we want in our lives can take a lot of work - it can be worth the effort in the end. The most important thing to note is - we shouldn’t take the journey too seriously. In fact, grab your accountability buddy and celebrate a small step toward your goals by doing something fun. Lost for an idea? 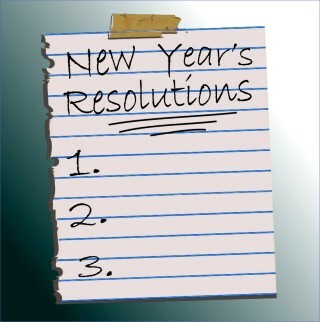 Check out our New Years Resolution pages - pages 6 through 9 in our hard copy.